On the afternoon of Tuesday, May 29, about 175,000 Starbucks employees will receive training aimed at rooting out racial biases in the wake of an embarrassing incident that has challenged fundamental parts of the company’s values and image. The Seattle-based coffee giant on Wednesday revealed glimpses of the curriculum it has developed for its unprecedented and closely watched effort. Starbucks’ response could be a reflection of how deeply shamed the company and its idealistic executive chairman Howard Schultz were by the incident, which went viral on social media, prompted protests that shut down a store and attracted coverage around the globe. Schultz has made no secret of his long-held aspiration for Starbucks to be a “third place” where people can feel comfortable away from home and work – so comfortable that they might be willing to engage in discussions about race with their baristas, as in the company’s 2015 “Race Together” campaign. In the weeks since the Philadelphia arrests, Schultz and other senior executives have kept the incident in the news with repeated apologies and new policy announcements. 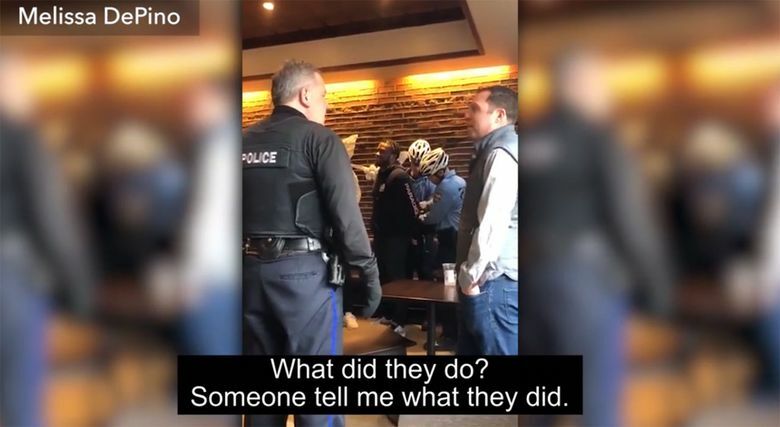 Additional incidents, of a black man being denied use of a bathroom in a Los Angeles store and a racial slur written on a Latino customer’s cup, have also received out-sized attention. The five-minute video and statement it released Wednesday previewing the curriculum show employees paging through a large-format “Team Guidebook” with step-by-step instructions that start by breaking employees into groups of three to five people for guided discussions, reflection and problem-solving. “As far as I’m aware, it’s really an unprecedented step in terms of closing down stores and conducting a training at that scale all within one day,” said Steven Dinkin, president of the San Diego-based National Conflict Resolution Center, which provides similar trainings. The closure for an afternoon will likely mean millions in foregone sales even though Starbucks’ afternoon business is substantially smaller than its morning sales. The company is also incurring costs related to development of the training – which it plans to share with other companies that may want to emulate it, including the independent owners of an additional 7,000 licensed U.S. Starbucks locations that aren’t expected to close on Tuesday — and an undisclosed financial settlement with the two men arrested. There have been less tangible costs, too. Starbucks’ carefully crafted brand suffered in the wake of the arrests. YouGov BrandIndex, which asks people if they’ve heard anything positive or negative about a brand in the preceding two weeks, found Starbucks’ score fell into negative territory in the aftermath of the arrests, reaching its lowest point since late 2015 when Starbucks changed the design of its holiday cups. “The reality is, being that third place in 2018 is far more challenging,” Johnson says, according to a transcript of his message in the training guidebook. While the company’s new policies would appear to open its employees to more challenging interactions, they could also simplify things. Those policy changes are essential, he added. While an afternoon of training might help employees become cognizant of their biases, it can’t be expected to eliminate them, Dinkin said. “5/29 will just be a start,” a narrator says at the end of the preview video.